Andhra Pradesh Rajiv SSA has conducted successfully the Sectoral/Asst.Sectoral Officers Examination 2017. This examination Merit list of Sectoral / Assistant Sectoral Officers 2017 to be released at ssa.ap.gov.in web portal. The District wise Merit lists would be uploaded in AP SSA official website. 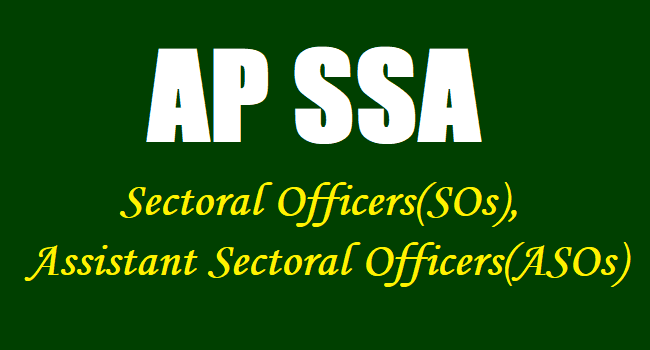 The candidates who were attended for Sectoral / Assistant Sectoral Officers examination 2017, they can download their concerned district wise merit list from the AP SSA Website. No teacher/Individual can claim right for deputation to RVM(SSA) based on the merit list. The antecedents of the individual, previous experience, track record and other issues will be taken into consideration for deputation to RVM(SSA). Department of Education may consider or reject the request of deputation to RVM and RVM will not give any assurance of deputation for the individuals. As per the necessity of the vacancy arises in the District Project Offices, the proposals will be submitted to C & DSE.